Luxury boutique hotel 137 Pillars Suites & Residences invites guests to celebrate the holiday season in style and take their year-end celebrations to new heights at the property. They can choose from a range of options available for staying, eating, drinking and just being merry with festive lunches and dinners, dazzling New Year’s Eve experiences and fabulous room packages. 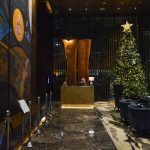 To get guests in the festive mood, the hotel will also be transformed into a magical place with warm lighting, sparkling fairy lights, with Christmas trees and decorations in the lobby and other public areas. Guests booking the year-end accommodation packages receive a variety of special seasonal extras on top of the usual suite benefits, which already include round-the-clock exclusive access to the rooftop pool and its panoramic views, 24-hour unrivaled service with a personal butler, and personal mobile with free unlimited international and domestic phone calls and 4G data during their stay. For an indulgent and magical Christmas break, book a Sukhothai or Ayutthaya Suite for two consecutive nights and get pampered with Champagne, gifts, an exclusive wine dinner for two at fine-dining restaurant Nimitr, 24-hours rooftop pool access, a Christmas turndown service, and because no Christmas is complete without a touch of sparkle, your room will also have its own Christmas tree. 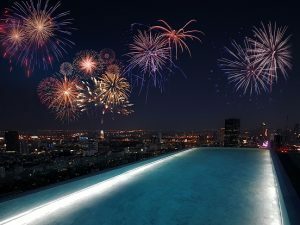 Welcome 2019 with our lavish New Year’s Eve package. Book a Sukhothai or Ayutthaya Suite for two consecutive nights and end the year in luxurious style with Champagne, gifts, a table for two at the exclusive New Year Wine Dinner at Nimitr, as well as complimentary access to the Countdown Party at Marble Bar, and much more. Guests can also partake in a range of merry feasts at the hotel’s two restaurants. Combining seasonal ingredients with classic tradition, our chefs have created something for every palate, from semi-buffet options to indulgent a la carte menus. Celebrate the spirit of the festive season with a special a la carte menu, which includes celebratory highlights such as Hokkaido Scallops with Cauliflower Puree; Rib Eye Fillet with Peppercorn Sauce; Roast Turkey with Cranberry Jus and traditional stuffing, and much more. For dessert, indulge in traditional Christmas Pudding with Brandy Custard, or the signature Christmas Pavlova. Seating is available indoors or in the festively decorated Jamjuree garden. Prices start from THB 220 (USD 7) per person and are subject to service charge and applicable government taxes. THB 3,500 (~USD 107) * (only food) and THB 4,500 (USD 137) (with wine pairing) per person, plus applicable service charge and government taxes. Enjoy the stunning views of the Bangkok skyline as this fine-dining restaurant celebrates the holiday season. The specially curated six-course Christmas set menu includes chef signatures of Alaskan King Crab Roll on Green Apple Jelly with Cured Tuna Loin and Konbu Broth; Creamy French Bean Soup with BBQ Lobster; Crispy Shallots and Crème Fraiche, Duck Leg Confit with Stuffed Lamb Loin, Chanterelle Mushrooms and Flavoured Potato Puree. End on a sweet note with the exceptional Red Velvet Christmas Yule Log Cake. Outdoor seating is also available at the Marble Bar. THB 2,500 (USD 76) * (only food) and THB 3,500 (USD 107) (with free flow wine) per person, plus service charge and applicable government taxes. Celebrate Christmas Day with us as your family indulge in an outstanding Buffet Brunch with live cooking stations serving seafood, grilled meats, foie gras, pasta, sushi, and delicious Thai street food. The Dessert Parade includes traditional favourites such as Panettone, Log Cake, Black Forest Cake, assorted Mille-Feuille, Mango Sticky Rice Cake, House-made Ice Cream, and so much more. There’s no better place to bid farewell to the old year and welcome in the new with your family and friends than the Bangkok Trading Post Bistro & Deli. Indulge your palate with a lavish array of appetisers, salads and desserts buffet style, and a choice of four festive main courses. Complete your meal with the dessert station, assorted popcorn bar, and the New Year’s Chocolate station before joining the countdown party with live entertainment at the Marble Bar on Level 27. THB 6,000 (USD 186) * (only food) and THB 7,000 (USD 213) (with wine pairing) per person, plus service charge and applicable government taxes. Chef Nanang has pulled out all the stops to create a fabulous seven-course menu to bid farewell to 2018, starting with a pre-dinner cocktail and live station serving his signature ‘Seafood Cone’, and a selection of three canapés. The menu for the exquisite seven-course dinner includes Canadian Lobster and Gold Ossetra Caviar; Sous-vide Turbot with Carrot Puree, Betroot Mascarpone and Chantarelle Mushrooms, and Grilled Kobe Beef Sirloin marinated in Asian spices and served with Black Garlic Paste, Pumpkin Mash and Ponzu Sauce. Continue the party at the Marble Bar with live entertainment as you countdown to the New Year with a complimentary glass of Champagne. THB 2,500 (USD 76) * (only food) and THB 3,500 (~USD 107) (with free flow wine) per person, plus service charge and applicable government taxes. Celebrate the first day of 2019 with family and friends at Bangkok Trading Post & Deli with a lavish buffet brunch, with live cooking stations serving seafood, grilled meats, and foie gras, to pasta, sushi, and Thai street food. The Dessert Parade includes traditional favourites such as Panettone, Log Cake, Black Forest Cake, assorted Mille-Feuille, Stollen, Bread Pudding and so much more. THB 2019 (USD 63) per person (plus service charge and applicable government taxes) and also includes mini bottle of bubbles. * Advance bookings are strongly recommended in order to avoid disappointment.